Diablo Valley Foundation for the Aging's mission is to provide compassionate services to help seniors maintain independence, dignity and peace of mind. 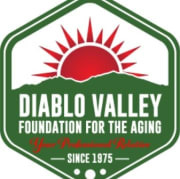 Diablo Valley Foundation for the Aging is a not-for-profit corporation providing community service to seniors in Contra Costa County since 1975. Founded by a group of community leaders including Dean S. Lesher, former publisher of the Contra Costa Times, and Katharine M. Grant, a social worker, the Foundation is committed to providing vital services to aging persons who are at risk because they are alone, isolated, pressed by financial problems, or are confused. The focus of our organization is to prevent inappropriate institutionalization of elders by providing the necessary support to maintain them in the community. Comprised of dedicated professionals and volunteers, we enable older adults to live with as much independence and freedom as possible. Would you recommend DIABLO VALLEY FOUNDATION FOR THE AGING?